One of the oldest textiles in the world and more relevant today than it has ever been. Since the 90’s linen has seen a huge revival, and little wonder it is one or the most beautiful fibres known to man. The history of linen goes back thousands of years. Evidence of its use has been found dating back to 8000 BC. It’s been prized throughout history for its strength and versatility , other than textiles it's been used for a variety of purposes, shields and armour, ships sails, artist canvases, even bank notes to name but a few. In Ancient Egypt it symbolized purity and wealth and was used for burial shrouds and even currency. It has long been the king of fabrics, the Bible even states that it was worn by angels. 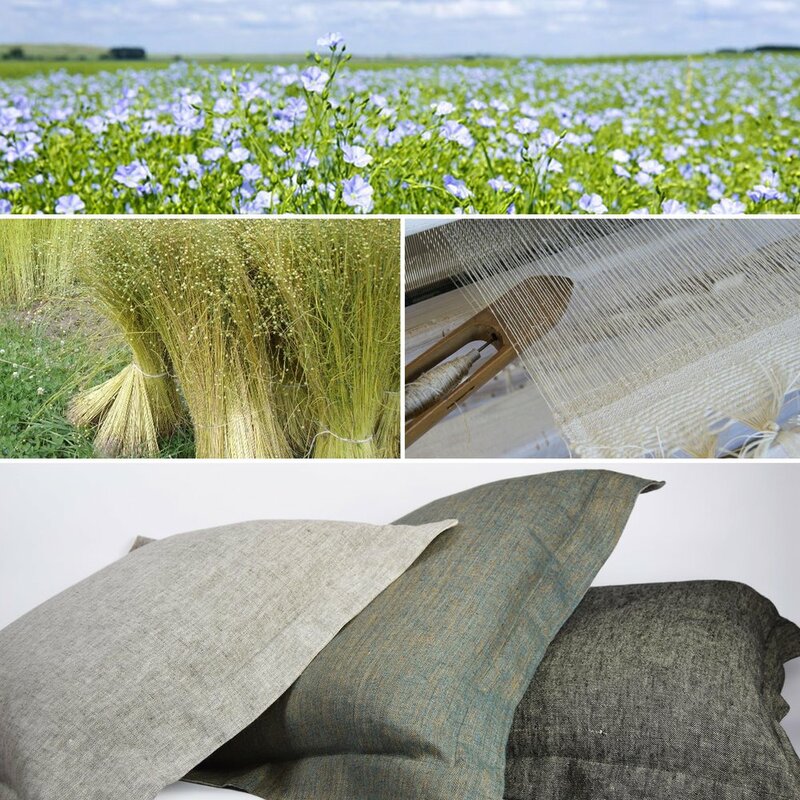 Linen is a natural fabric created using the beautiful blue flowering flax plant, which in many cases is harvested by hand, then tied into bundles and left to dry in the fields. Seeds are then removed for the next years crop and the fibres are taken from the stalk of the plant and spun into yarn. It has always had a perception of high value, mainly because flax it is a very labour intensive crop and it is difficult to weave with as the thread has no elasticity so can break easily. Great care and skill are needed to weave it into cloth. Being a natural fibre, there is an unevenness about its look. Changes in the thickness of the yarn give it a unique look. Linen is cool to the touch, smooth and gets softer with repeated washing, which is why the fabric we use for our cushions has gone through a rigorous washing process before being made into our products giving them an unmistakable luxurious feel. You almost get a sense that they have been touched by angels.